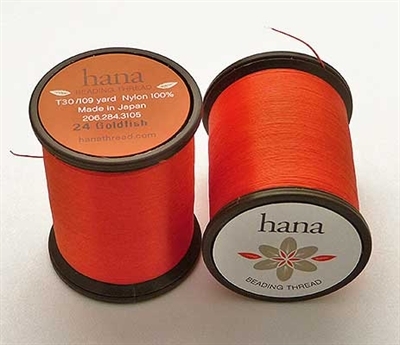 - Hana FINE JAPANESE BEADING THREAD by Midori Matsui is available in 12 vibrant, colorfast colors. - Made of 100% Colorfast Pre-Waxed Nylon (T30) for superior quality, strength and performance. Resists fraying or stretching. Perfect for off-loom weaving and laddering. Works well with a Size #12 Beading Needle and can be cut or burnt using a Thread Zapper. - Sold per Spool and Packaged on a convenient plastic spool containing 109 yds. of thread.